It is estimated that about 150,000 Palm Pre units have been sold to date, as we said yesterday. However, it looks like owners just can’t help getting new applications for their webOS-powered smartphones. 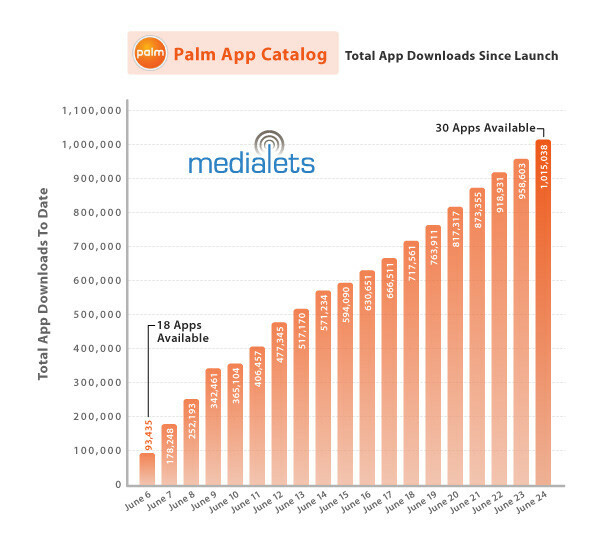 According to the New York-based mobile analytics company Medialets, the users have already downloaded more than one million apps from the Palm’s App Catalog. That figure sounds like impressive indeed, especially having in mind there are as many as 30 apps, currently available on the storefront (all of which are free). Having said that, we certainly hope to see more and more mobile programs surface on App Catalog soon enough. i smell BS, just like their initial launch numbers were BS as well. Pre on VZW in less than 3 months. good job palm............now you only need 999,000,000 more to compete with applepalm on vz? uh think again............30 apps compared to apple's thousands? I would hope apple would have a bunch of apps since its been out for soooo long. behold is definately an IPhone Nuthugger, im embarassed for how much of a hater you are. It hasn't even been out for 2 years yet. And it's not like the palm is like this new company that doesn't know what it's doing. Everyone keeps saying that we have to give the pre some slack because it's only version 1. But the thing is that they have Jon Rubinstein on their side who knows what he's doing and he has been with Steve Jobs/Apple for 16 years (that's what I read). And it's not like Palm wasn't watching other phones. Palm knows that they better put copy and paste by watching the iPhone. They know that most smartphones have to have push email and exchange. They know that they have to put a great web browser on their phone, etc. Just because the pre is version 1 in WebOS doesn't mean anything. I actually think that's an advantage because they can choose what to put and not put in their phone just by sitting back and watching for a while. That's because the iPhone is a TOY. T-O-Y. Let's hop on the bandwagon and get one because we want to be tredny and unique like everyone else! The Pre sounds like it would be an invaluable business tool; I just got the Storm and it's pretty much PERFECT for not only work, but my home business as well. I look at these business owners that have iPhones and question their integrity, to be honest. Am I the only one?